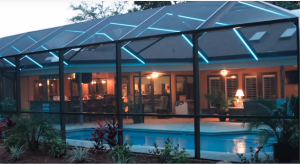 Providing the best patio, screened in porch solutions, and pool screen enclosures Fort Lauderdale has to offer has been our pride and joy for many years. We can easily relate to the desire to turn your home into an area of relaxation and recreation, and want to do everything possible to help build and maintain your backyard oasis, at an outstandingly low cost. At our company we strongly adhere to our principles of not only the highest quality of work and longevity of our installations, but our customer service as well. Our number one goal is satisfying all of our customers unique needs, including flexible financing in order to give you an affordable screen enclosure on demand. Whether you are looking to curate your personal paradise through means of a pool cage in which you can swim long into the year with UV protection from the sun and an escape from bugs for your family, pets, or perhaps even special plant life, or simply require a smaller screen room or enclosed patio for grilling and outside dining, FLL Screen Enclosures has these solutions and so much more. Our aluminum screen assemblies are designed to be both exceedingly durable as well as lightweight, allowing them to be safe in structure, and posses a hurricane proof resilience that can put any south Florida resident's mind at ease. While we make it a point to not sacrifice any bit of quality for a quick job, we are proud to say that we have an excellently fast speed of building projects. So you can be rest assured that if you choose to undergo a patio screen installation your home will not be in a state of disrepair, as the construction process is seamlessly efficient. We guarantee that if you choose to partner with us, our highly skilled screen enclosure contractors will impress you with how quickly they can turn your vacant or underutilized yard into a quality extension of your home, and one that will offer a peaceful escape for all seasons. 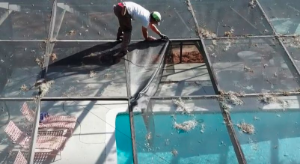 At FLL Screen Enclosures of Fort Lauderdale we love any opportunity to assist customers in bringing their ground up ideas to life, but we also dedicate extensive efforts toward maintenance and patio or pool enclosure screen repair. We will work hard to ensure that your home investments will stand the test of time and continually add value, starting with a firm foundation, and providing low repair cost solutions for all the unseen events that may present themselves after that. 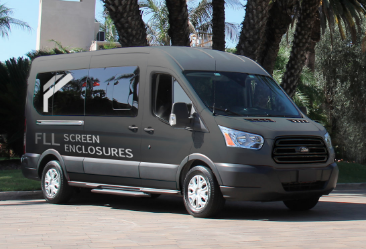 Our overall progressiveness in the industry, care for customers, and fair building and repair cost estimates are just a few of the things that we are carefully attentive to, in order to maintain our position as the most respected and best option for services in screen enclosures Fort Lauderdale has come to rely upon. If you have any interest in a new home screened area project, or just need some help getting an old structure back in top shape, don't hesitate to give us a call today and ask about our options and rates, as well as possible promotions! If you are a business in Broward county, you will be happy to know that our screen enclosure services go far beyond residential needs. We have also crafted, maintained, and are well equipped to handle commercial projects of all scales. Some of these have included but are not limited to apartment properties, restaurants, rooftops, and even solariums and bio-domes. Our highly trained and skilled screen builders have also found great solutions for a large variety of unique scenarios, and can help design and install structures to work around any possible needs or obstacles. So don't worry about sacrificing a screened in deck or enclosure for the sake of telephone lines, chimneys, balconies, or landscaping and trees. Each of our installations are specially created to match your home or business while smartly solving or avoiding issues like these. Feel free to call us if you would like to hear more about these capabilities or run through our enclosure cost estimator. For both residential and commercial constructions, FLL Screen Enclosures also offers a great selection of additional systems, features, and add ons for your screen rooms. 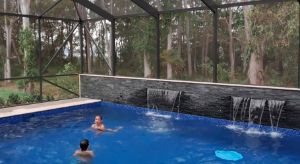 These could include integrated child safety fences for your pool cage, lighting kits that can provide an amazing nighttime ambiance, speaker systems for gathering and parties, a variety of visibility sections and doors for you or your pet, and so much more. Custom requests are also available in our window treatment and roofing departments, some of these being one of a kind designed decorative entryways, pavilions, partial sunshades, or beautiful roof trim detailing. The possibilities of customization are endless, and we would be happy to work with you to find any of the options you may want to help turn your enclosure into the most effective and personal home addition. Sometimes we find that our clients who are interested in customization are also very DIY centered, and we totally understand that! For this reason we also offer several do it yourself systems like rip repair materials or screen house kits, which you can simply purchase, as well as utilize our experts for any particular assistance or advise if desired. Whether it's a new assembly or just some consulting, every project that we participate in is completed by fully licensed and insured workers, including all stages from initial permitting and designing all the way through to the final build and upkeep. So you can be confident that when you choose to work with our team, you are getting the absolute best and most trustworthy tradesmen in the industry who's foremost priority is your satisfaction and safety. For many years, our pleasure has been found in providing magical spaces that offer comfortable areas of rest and entertainment, giving you another great opportunity to get some fresh air and lay under the sky without allowing the elements to get in the way. Enclosures are also an awesome way to drastically enhance your home's square footage, usability, and overall value, and do all of it in a aesthetically pleasing way! While it is our flagship offering, our Fort Lauderdale screen rooms are one among many services that we offer at our business. So we encourage you to check out all of our additional areas of expertise in the services section, and if what your looking for isn't listed, give us a call because there is a good chance we have either done it, or can easily make it happen for you today. One of the great specialties we can bring to your home or business that people sometimes overlook in a screening company, is our extensive aluminum fabrication capabilities. While these skills play a large role in providing screen room substructures, we also utilize them to form fences, railings, gutter solutions, and beautiful decorative additions to front doors, garages, or roofs. Our highly practiced shop techs have a ton of great precision tools with which we can bring any of your ideas to life, or help you arrive at something thats unique to you even if you're open to ideation and don't have an exact idea of what your looking for. Furthermore, we have a great sundry of options when it comes to material color, texture, and special properties. For example many customers have been very pleased with the results of using our alumawood material for porch and patio overhangs, a finish offering a fantastic traditional look that is still long lasting. Other popular color schemes can include charcoal grey, white, plane aluminum, earth tones, and more glamorous selections like bronze. We can also gladly provide assistance in any of your home's soffit, fascia, and gutter needs. All of our work is completed with the utmost craft, is seamless, and is made with tailored aesthetically complimenting designs. Soffits and facias can be a great way to increase your house energy costs through proper ventilation to the attic, as well as provide protection from the many insects and invaders that we find here in south Florida. Aside from installation we can also assess your current soffit for many of the signs that can help prevent more expensive repairs down the road. Some of these being sagging and splitting, dry rot, as well as the infestations of bees or termites. Another less exhilarating but important service we offer is enclosure cleaning and maintenance. Taking proper care of your structures can be a great step toward ensuring that they will be around for years to come, as well as keeping those bad green build ups and growth colonies in check. Here we use a great soft wash technique with effective but safe cleaning solutions to gently bring your frame back to purity, ensuring the integrity of your fasteners, anchors, and clips that can sometimes be damaged when using high pressure cleaning systems. We understand that it can be a daunting task to keep the often extremely elevated screen top free from fallen leaves and needles after a storm rolls through, so we provide one time or scheduled cleanings in which we can come by and quickly get it taken care of with the proper equipment so you can stay safe on the ground. We also have you covered when it comes to protecting your assets through hurricane preparation with the use of storm shutters, impact resistant panels, and the increasingly popular storm curtains, which offer great easy setup features like electrical rollout. Thanks for checking out our business, we would be honored to serve you and use it as an opportunity to show you why FLL Screen Enclosures in Fort Lauderdale is the leading screen building company in Broward County, as well as Miami-Dade, Monroe County, and the Florida Keys. Give us a call to discover our coupons and discounts and we can get you started on your next home addition today at the best prices in Florida!